A new survey of cell phone users found that 20 percent of potential buyers let the iPhone 4 antenna affect their purchasing decision, but three times as many expressed dismay that Apple's smartphone is not available on U.S. carrier Verizon. 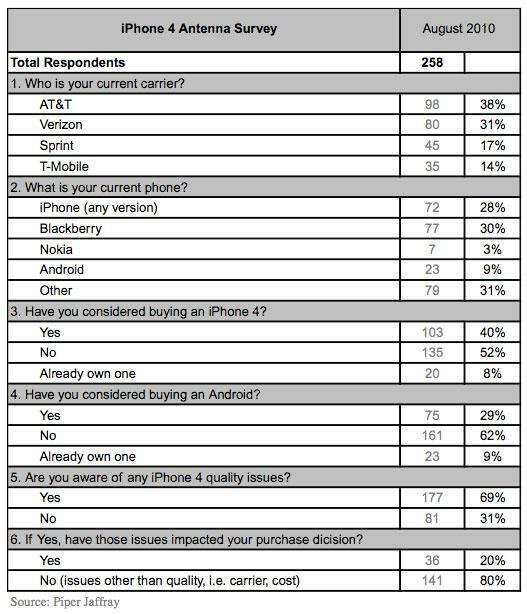 Investment firm Piper Jaffray recently surveyed 258 cell phone users in Minneapolis, Minn., on the iPhone 4 "antennagate" controversy. A total of 177 respondents, or 69 percent, indicated they were aware of issues with the iPhone 4 antenna. Of those, 20 percent said that the antenna controversy affected their decision on what smartphone to buy. "In other words, our survey suggests that Apple is losing up to 20% of potential domestic iPhone sales due to the antenna issues," analyst Gene Munster wrote. He noted that could correlate to 880,000 fewer unit sales in the September quarter in a worst-case scenario. Apple calmed much of the controversy over the iPhone 4's reception, which can be negatively impacted by touching the lower left corner of the device, when it announced in July that it will give away free cases to all who buy the handset through Sept. 30. As that deadline approaches, Munster said he believes Apple will either extend the case program, or reveal further details on its own testing of iPhone 4 reception. Munster added that though the survey did not include a question specifically asking about the iPhone coming to Verizon's network, most respondents broached the subject anyhow. "We found that for every one respondent that acknowledged the antenna issue, about three complained about the iPhone not being on Verizon," he wrote. "In other words, the lack of an iPhone on Verizon is holding back sales by about three times more than the antenna issue." In recent months, numerous rumors have suggested that Apple will bring the iPhone 4 to Verizon in January. Reports have alleged that the company will manufacture a CDMA iPhone that is compatible with the largest wireless network in the U.S. In Piper Jaffray's survey, most respondents —30 percent —are currently BlackBerry users, while 28 percent own an iPhone. A total of 40 percent said they have considered buying an iPhone 4, compared with just 29 percent who have eyed an Android device.